Divide your grains into 3 pound increments. One batch will be steeped and turned out onto a floor. The cistern will be refilled with another 3 pounds of grain for steeping to follow suit. The malt floors are used in a circular manner to keep production flowing. Wash the grains well, skim off any floating husks and drebis. Steep them in clean water for 48 hours, change the water at 24 hours. Longer than 48 hours total steeping time provides a chance for microbial contamination. When the grains absorb moisture to 70% of their original weight, they have steeped long enough. The end result is a plump grain as opposed to a dried grain. Any bad grains (ones that have dried up) will float to the top and can be poured off. 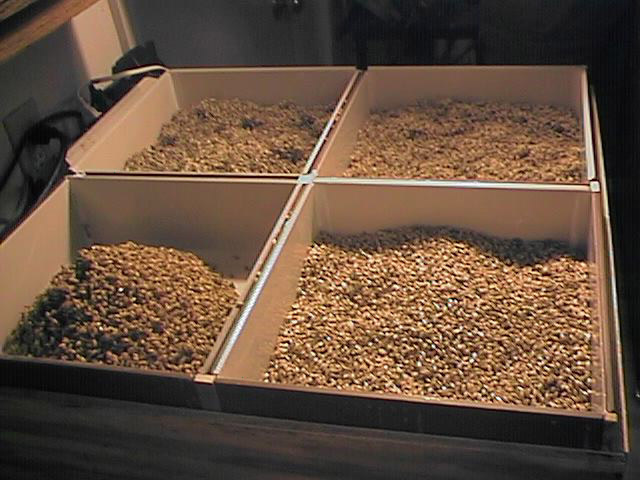 You can drain off the excess water and re-weigh your grains to see if they have increased in weight 70%. A fired clay pot that has been glazed for moisture resistance makes a good cistern. Any glass, stainless or plastic bowl will also work as long as the size is large enough for water to stand at least 1 inch above the grain. Lightly drain the water from the grains and pile them into Floor 1. Refill the cistern with 3 more pounds of grain to steep for the next 48 hours. Now the grains are piled in a heap on Floor 1 for 48 hours. This is referred to as the "couch". Piling the grains allows heat to build up in the pile, helping to begin germination. The grains should be turned once at 24 hours while in the couch bringing the grains from the center of the pile to the outside and the outer grains to the inside. Any excess water is absorbed by the plaster and is held there, providing moisture to the grains, but not allowing them to sit in a pool of water. At the end of this stage, the seeds should have tiny white buds beginning to show. Be sure to refill your cistern with the second 3 pounds of grain for steeping 48 hours. The grains are now moved from Floor 1 to Floor 2 for 48 hours . Spread the grains out evenly, do not couch them on Floor 2. This has a two-fold purpose. Primarily, it provides the turning of the grains which controls moisture content, aerates the grain and destroys heat buildup in the couch. Secondly, it provides an empty Floor 1 which can now be filled with steeped grains. Be sure to refill your cistern with the third 3 pounds of grain for steeping 48 hours. The grains on Floor 2 will develop long, thin rootlets. The grains are now moved from Floor 2 to Floor 3 for 48 hours. Spread the grains out evenly. The grains begin to grow the acrospire or stem from the same end as the rootlets. To observe this, you may have to remove the husk from the seed. The stem grows up the seed towards the opposite end from the rootlets. Conversion from starch to sugar within the seed is how the seed provides the sugar it will need to grow the stem of the plant. Transfer the grains from Floor 1 to 2 and fill the first floor with fresh soaked grains from the cistern. Begin steeping the fourth 3 pounds of grain in the cistern. The grains are now moved from Floor 3 to Floor 4 (approx.) 48 hours.. Spread the grains out evenly. The stem should grow to the length of the seed. This is a measurement whereby the grain is said to be "fully modified" in converting starch to sugar. Grains where the stem is shorter than 3/4 of the seed in length are considered "under modified". "Over modified" is where the stem has grown beyond the length of the seed. Now the sugar the seed has stored is being used by the stem to grow. It is best to take an average of the grain population to determine if the grains have fully converted the starch to sugar. The grains should then be dried in an oven on "warm" with the door propped open and stirred every 6 hours until crunchy and the rootlets fall off when abraded approx. 48hours. Finally, transfer the remaining steeped grains on the floors. Continue transferring grains to consecutive floors every 48 hours until all are done. Note: Germination times are based on 6-row barley grain. Times are cut in half for malting wheat or other smaller grains. To obtain information on period malting and malthouses, you can download my Queen's Prize Tournament Documentation (PDF format) by clicking here. It has information on malting, grain selection, and design of other portions of the malthouse. Check back later for plans for a table-top grain kiln.